"Left Fielder Alejandro De Aza #12 of the Baltimore Orioles makes a catch on a hit by Adam Eaton #0 of the Chicago White Sox in the sixth inning at an empty Oriole Park at Camden Yards on April 29, 2015 in Baltimore, Maryland. Due to unrest in relation to the arrest and death of Freddie Gray, the two teams played in a stadium closed to the public." One never can predict the future. This includes a more than 45,000 seat major league stadium being empty during regular season play. I've been on paternity leave for the past month and have been watching the unrest in my backyard of Baltimore City due to the arrest and death of Freddie Gray. My first day back to work was on my birthday, and was related to the ongoing news, but in a different part of the city. 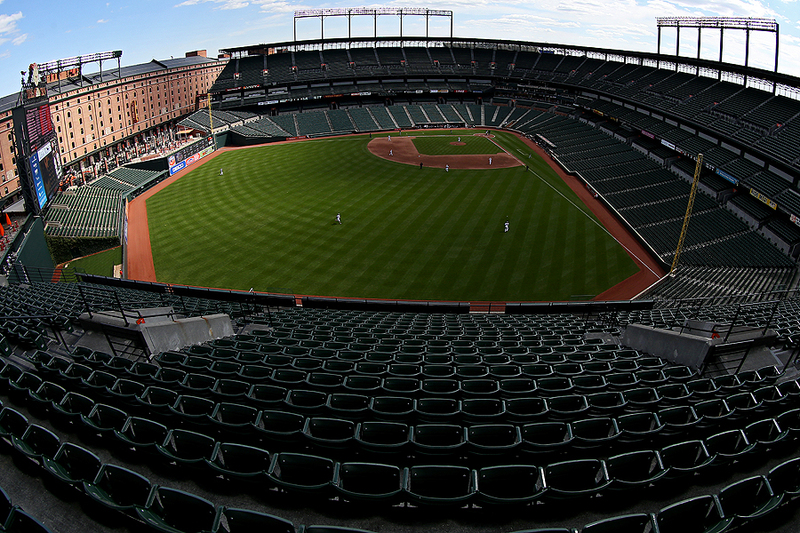 After having one game postponed due to rioting and protests, the Baltimore Orioles decided to host the Chicago White Sox with zero fans - a game closed to the public - for the first time ever in Major League Baseball history. There isn't much to describe the feeling being one of the few members of media, photographers allowed in the stadium to document a very historic game. The first word is fortunate that we at Getty Images were allowed inside to document. Second word would be sad, as the unrest in the city is nothing short of tragic. But more or less, if I could only choose one word, it would be surreal. I'm finding it difficult to find a favorite image, but I kept coming back to this picture.